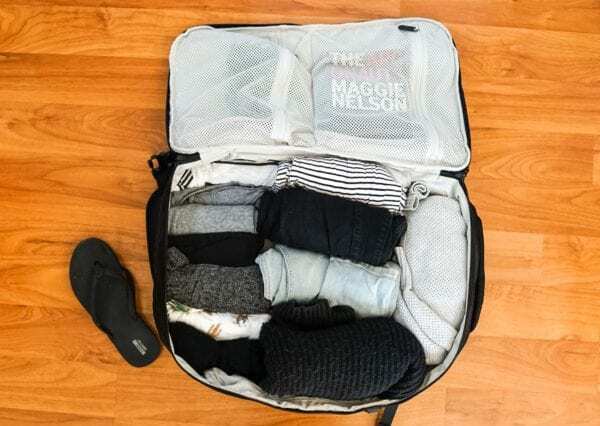 Does Rolling Clothes Save Space in Your Luggage? What are the Advantages of Rolling Clothes? Ah, the age old debate of flat packing vs. rolling clothes for travel; a mainstay conversation topic of hostel bars around the world. While some travelers swear that rolling your clothes is the best possible method, others shrug and say it doesn’t really matter. Online, I sometimes wonder if we’re making this claim blindly — following the advice of others without having stopped to compare the two methods. So, curious to know the truth, I set out to run a test and find out: which really is better? Flat packing or rolling your clothes for travel? One of the most popular reasons people give for rolling your clothes over flat packing is that it saves space in their carry on backpack. So, to test this theory out, I first flat-packed then rolled the exact same set of clothes. Everything fit in snuggly, but the bag wasn’t so full it was bursting at the seems. I even had a small space on the side where I could slip a pair of flip-flops in. Like before, everything fit snuggly but the bag was not bursting at the seems or hard to zip up. Everything fit in both versions. The biggest difference wasn’t more or less space, but rather where the extra space was. This is especially true with a conventional hiking backpack, where the layers of items — if packed incorrectly — can create pockets of unused space throughout. The even results happened, partially because bulky clothes, like the sweaters, were going to be bulky and take up a lot of space no matter how I packed them. A compression sack is the only way I’d be able to get the sweaters to take up less space and fit more in my bag. Thin clothing, like the t-shirts, did pack better and take up less space when rolled. Or, at the very least, they had the appearance of being more compressed. I also would have been able to fit a couple of rolled items in the side of the bag in the flat-packing version if I had decided to combine methods. While rolling clothes helps you maximize your space (by filling the bag from edge to edge), it doesn’t really save you space. If you really want to fit more clothes in a bag, use a compression sack and put thought into the type of clothing you’re packing. For example, two bulky sweaters took up the same amount of space as seven t-shirts. I could have swapped out one sweater for two long-sleeve shirts if I’d wanted to bring more stuff (which I usually don’t). Packing cubes are another option for compressing things just a little bit and keeping your clothes organized in travel backpacks. If you invest in cubes that are heartier than the flimsy cheap-o ones the structure will help find a little more space in your bag. To that end, rolling your clothes can be very effective. Especially for items that wrinkle easily (like gauzy dresses), rolling can be a simple way of keeping them neat. Depending on how you roll them, however, you may still end up with a crease. To solve this, bring a small bottle of wrinkle releaser ($8) or briefly toss clothes in the dryer once you’re at your destination. Or, do as the pros do and roll your clothes military style. As you can see in the rolled clothing example, I had much better visibility into my backpack when the clothes were rolled. I could see all of the items I’d packed at a glance, rather than having to rustle through a pile to find the right top. It simply looks more organized and it’s easier to find items quickly. Up your organizational game one more level by adding packing cubes. If I had wanted to fit more clothing into the flat-packed version of my packing list, I could have rolled a few t-shirts and stuffed them along the sides. Rolling clothes helps you put items in smaller pockets of space. In the end, though, it’s best to use a combination of both methods. If you have a traditional backpack (where you can only stuff from one end), create a flat bottom by stacking rolled clothing on the bottom, then layer with flat layers. Fill small pockets with rolled clothes or other small items. 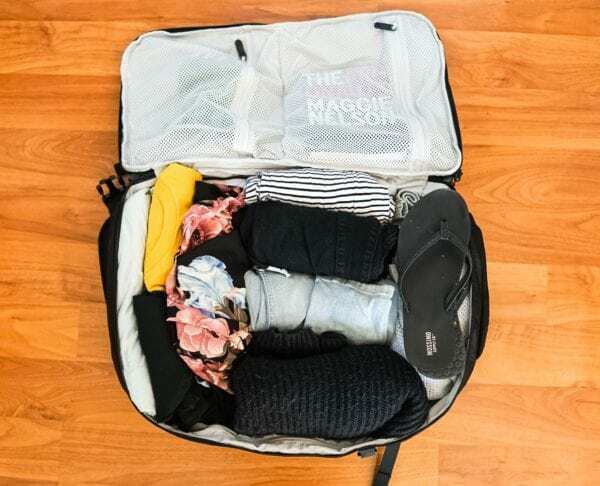 If you have a suitcase or a backpack like the Outbreaker, group rolled clothes on one side, flat on the other or stack rolled items on top of folded pieces. 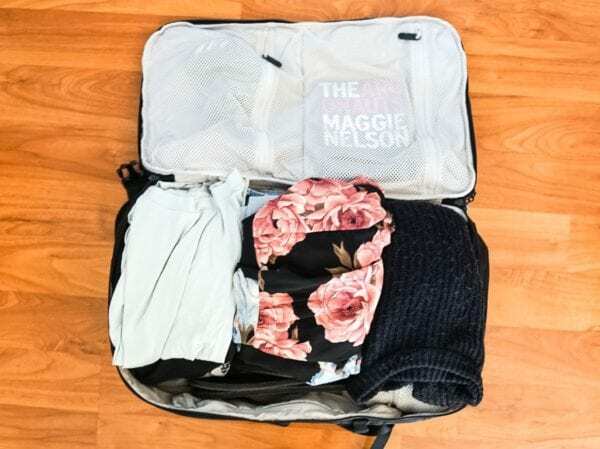 While rolling clothes can help you create a better organized bag, maximize space, and keep clothing wrinkle-free, it isn’t a magic method that will help you bring more clothing. Flat packing and rolling clothes are equally effective to that end. The best way to pack your clothes would be a combination of both. Flat pack bulkier items, like pants, and roll smaller or more delicate pieces of clothing, like a dress or shirt.